Hansel and Gretel didn't become a classic for nothing. This seemingly simple fairy tale about two kids who defeat the wicked witch deals with numerous popular literary motifs. It's known in numerous versions, today often sanitized to avoid unnecessary fear of one's kids - to be abandoned by their own parents. Even in its most politically correct versions Hansel and Gretel offer so much it's only fair to further explore some of the most known themes in this immortal fairy tale. Why? Even a vague analysis can give us an impression of the elements crucial for successful literature. Not only literature for children but literature in general. Here are 10 themes from Hansel and Gretel. This theme addresses our most primal fears. Parents feel responsibility for children and are sometimes inclined rather abandon them than risk not being capable of properly taking care for them. Numerous children are still abandoned every day all over the world. On the other hand, kids are afraid of being abandoned too. This is also true for kids growing up in a positive environment. Kids, on a certain, sometimes only subconscious level, are feared of losing their parents and protectors anyway. We are not afraid of the real woods as much as were people a few centuries ago, but we are still living in a very competitive, often ruthless world where a single mistake can cause irreversible consequences. Hansel and Gretel start as helpless kids but are forced to find shelter and food. Soon after they are forced to fight for their life with a wicked witch. They have to grow up to achieve all that. If we think a bit, it's probably the most common theme of all fairy tales. They almost always end with a marriage and/or getting great wealth. For both we need responsibility. Responsibility is one single thing which separates childhood from adulthood. Cannibalism is one of the oldest and most persistent taboos in human civilization. Some primitive societies still practice it and in a symbolic way, we can find it in most common religious practices even today. Communion in the Catholic Church is the symbolic eating of Christ's body. 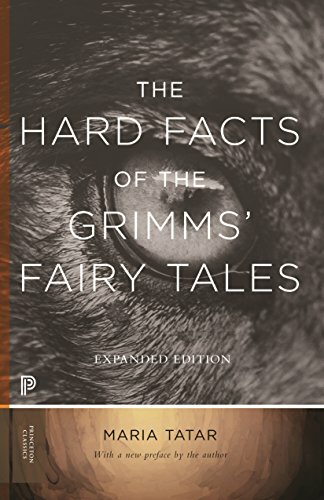 The theme of cannibalism in Grimms' fairy tales is present in several tales and always very strictly punished - with death. When we are talking about their fairy tales we should know that Jacob and Wilhelm were very religious. Studies of their written records show they deliberately added many religious elements to otherwise pagan associations. We have a witch, cannibalism, and sacrifice of children as pagan elements on one and birds, prayer, and forgiveness as religious elements on the other side. Following the dove which often symbolizes the holy spirit and crossing water before returning home are only two of the most known scenes in Hansel and Grethel. Even the names of major characters are related to Christianity. Hansel is short for Johannes (John in English, Johanan in Hebrew, meaning Yahweh is gracious. Grethel is short for Margarethe (Margaret in English, Margarita in Latin, meaning pearl). Margaret is a patron of expectant mothers, known by her escape from the dragon, what is another common motif of stories where Christianity meets paganism. Parents are obviously stronger than kids and they have to obey them. When they already know about their plan with leaving Hansel and Gretel in the wood, they still obey, relying on their wits (it works for the first time but not in the second case). The witch is even more powerful opponent, but they fight her with their wits and the witch is defeated. The family starts in total poverty, starving and thinking about abandoning both kids to improve the chances of survival at least for parents. In the end, Hansel, Gretel, and their dad have enough money to stop worrying about their existence. Most fairy tales end with the major character(s) gaining wealth and/or improved the position in society. When Gretel cries, Hansel consoles her. When he is in the cage, she is helping him with advice and eventually rescues him. They both stay loyal to each other. What is even more important, they both stay loyal to their father right to the end of the story. Such an attitude is very typical for Brothers Grimm who had very high appreciations of their parents and grandparents. It's the most popular theme in fairy tales, partly overlapping with the theme of growing up. We could actually say it's a must for a story to be defined as a fairy tale. Hansel and Gretel are not only alive and safely back at the end of the story, but they are also clever, strong and responsible as well. An immense change for helpless kids from the beginning, right? Their personalities completely changed. The change is inevitable for all other characters too: the father is full of remorse, stepmother and the wicked witch are both dead. Despite everything bad already happened at home and having their own resources (precious stuff from witch's hut), kids still want to get home and are willing to confront new dangers to achieve that. This makes the ending even stronger than the other obvious possibility for ending (they could stay in the witch's hut, like Town Musicians of Bremen in another fairy tale of Grimms, for instance). We conclude our exploration of themes in Hansel and Gretel without even touching some other themes, like justice and punishment or other themes which only add to the power of this classic fairy tale. Hansel and Gretel obviously stood the test of time and is still popular two centuries after being published in the collection of Brothers Grimm. What is the Major Theme in Hansel and Gretel in Your Opinion? Hi, dustytoes, it's always great to see you. Grand finale of Hansel and Gretel happens when Gretel pushes the witch into the oven. After that different versions vary. At Brothers Grimm they find a lot of precious stones in the house and return home to their father while the step mother died in the meantime. In some versions they return to both parents. In opera version they don't find material values but save all children who were previously caught by the witch (and changed in gingerbread). Etc. I honestly didn't remember how the story ended. The kids being abandoned by the parents and getting lured in by the witch with her house made of candy is all I remembered! And I certainly never gave this much thought to the themes throughout. Your commitment to the study of fairy tales is impressive. You are making a contribution to public understanding of a neglected area of thought. Hi, DerdriuMarriner, thanks for questions. No, I can't say for sure who is older of them, but somehow, partly supported by illustrations, looks it's Hansel who is older. They both progress, though. If nothing else, he learns to listen his sister's warnings (and is rewarded for that). The other question ... Yes, we have several fairy tales with forgiveness (Hansel and Gretel obviously forgave their father and, depending on the version, their mother as well) and reconciliation. Of the top of my head there would be Perrault's version of Cinderella where she not only forgives her step-sisters but arranges they marry well too. But in my opinion audience prefers versions with punishment - they carry a bit of tragedy what is traditionally good for business. Who would remember Romeo and Juliet if they lived happily ever after? Old Greek writers always said: "I will listen to my audience. If they laugh, I will cry. And if they cry, I will laugh because I succeeded to make a drama with catharsis." This is definitely one of the most important reasons why was comedy always treated as kind of inferior to drama. Most popular fairy tales can also posses some funny elements but they are not essentially funny. Tolovaj, Thank you for the back- and front-stories and products. Do we have any idea in any of the versions where Gretel and Hansel stand in their family birth order? 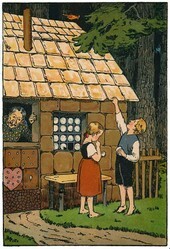 The depiction of Gretel develops progressively, definitely if she is younger, and even if she is older, than her brother. In another, but related, direction, is there any fairy tale in which there's a reconciliation between, instead of justice and punishment of, the bad and the good? You are right, Mira. It's only one of numerous examples where the accusation of common stereotypes (passive girls in fairy tales) fails. It's also one of rare fairy tales with a dynamic interaction between characters - at first Hansel dominates in brother-sister relationship, but then she leads the way and saves him twice. It's interesting that Gretel, a girl, saves Hansel from the cage :) Quite a progressive view. And there are many similar instances in fairy tales. No worries, blackspanielgallery. It's a never ending process:) But rewarding too, just like an exploration of, let's say, collectibles. It neverred to me to search so deeply such a story. Do you wonder about meanings and symbols in fairy tales? Classic stories like Bluebeard are loaded with them and here is a selection of some popular ones.